"Where the Fun begins and never ends...."
Paddy O’Leary’s Irish Pub is a marvelous place to meet people, to have a beverage and chat. The Pub definitely has the feel of an authentic Irish Pub. Scenes from Ireland can be found in the photos placed around the interior. Entertainment of some sort occurs every evening. Take a look at our events calendar. 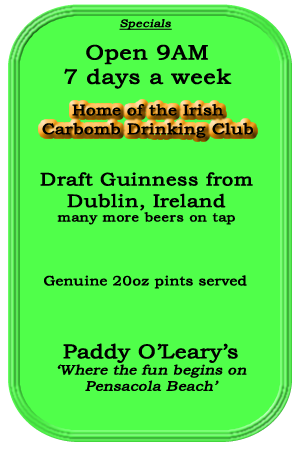 The signature drink at Paddy O’Leary’s Irish Pub is the Irish carbomb. Rewards are given to those who achieve milestones. For example, drink 20 carbombs and you are rewarded with a t-shirt announcing to all of the world that you are a member of Paddy O’Leary’s Irish Pub’s Irish Carbomb Drinking Club. Then you enter into the Irish Carbomb Drinking Club Hall of Fame with your name and date of the accomplishment inscribed on a plate and fixed to one of the placards placed on a wall for all to see that come to Paddy O’Leary’s. Football is a major event at the Pub. We have loads of college games every Saturday, NFL Sunday Ticket every Sunday and NFL games Monday and Thursday nights. Plenty of beverage specials are offered --such as $2 domestic bottled beer, 2 pitchers of domestic beer and a whole pizza for $20, $2.50 shots, etc. We have announcement boards at the Pub with all the specials we offer during football season.